SPC Solutions - Contractor Attitudes Toward Sustainable Buildings in the Russian Market: What Has Changed From 2010 to 2014? Although trailing behind well-developed real estate markets, such as the U.S., Europe and the Gulf, the development of green buildings is finally gaining momentum in Russia. In 2010, there was only one certified green building in Russia; in 2014 the number has reached 26, a sign that the green building sector is becoming more and more viable for real estate developers. At the same time, professional associations are stepping up their efforts to further promote sustainable construction and development practices. The Russian Green Building Council (RuGBC), established in 2009, is leading this activity and playing an increasingly prominent role in the setting up of sustainable construction and development standards. Nevertheless, it should be recognized that green buildings, like any other development project, are delivered by the combined input of a diverse group of stakeholders, including the building owner, designer, contractor and various other service providers. Although trailing behind well-developed real estate markets, such as the U.S., Europe and the Gulf, the development of green buildings is finally gaining momentum in Russia. In 2010, there was only one certified green building in Russia; in 2014 the number has reached 26, a sign that the green building sector is becoming more and more viable for real estate developers. At the same time, professional associations are stepping up their efforts to further promote sustainable construction and development practices. The Russian Green Building Council (RuGBC), established in 2009, is leading this activity and playing an increasingly prominent role in the setting up of sustainable construction and development standards. Nevertheless, it should be recognized that green buildings, like any other development project, are delivered by the combined input of a diverse group of stakeholders, including the building owner, designer, contractor and various other service providers. In particular, it is the contractor who plays an essential role in the project delivery process. 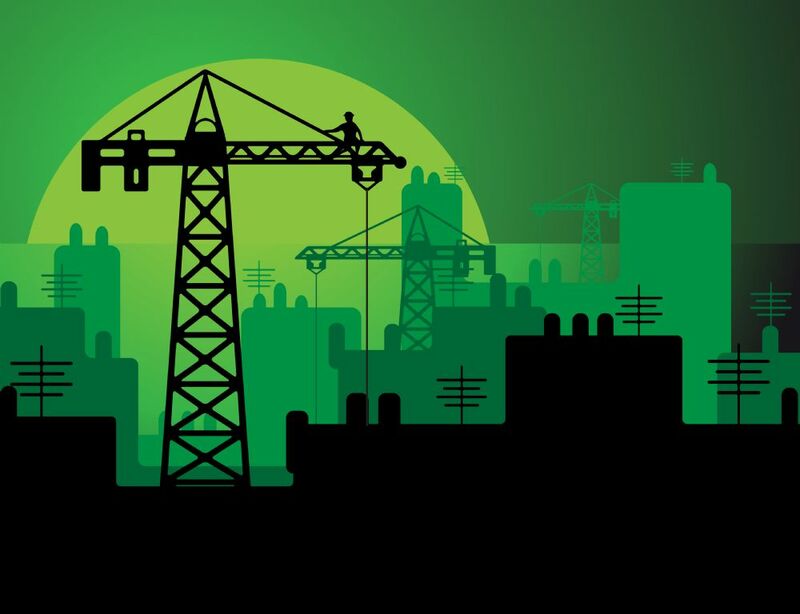 All major green building standards, such as BREEAM and LEED, acknowledge this by allocating a significant number of credits for contractor operations and practices that need to be earned during construction for a building to achieve certification. For example, under the BREEAM standard, requirements pertaining to contractor operations can correspond to 15–18% of the overall points within the grading for green building certifications. Compliance with such requirements by the contractor can make the difference between a successful certification or not. As green buildings celebrate their fifth year in Russia, where do contractors stand in terms of the progress of the green building sector and how are they approaching certification requirements? Although considerable efforts to promote green buildings in Russia have been made for some time in various circles involving developers, designers, consultants and academia, the contractors that play a key role in green building development were largely absent from any association with the sector’s earlier days. For example, at December 2010 the number of contractors and builders that were RuGBC members was less than 6% of the total number of members. To date in 2014, this number has risen to some 20%. Correspondingly, in order to understand the perceptions of contractors in Russia, the author of this article conducted a survey in 2010 to investigate their attitudes toward major green building standards. 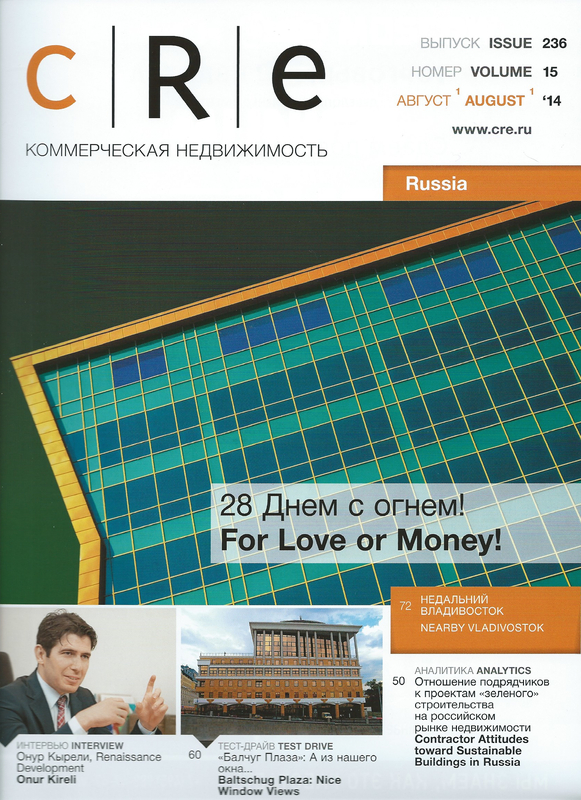 The results were published in #16(145) issue of CRE Russia in August 2010 (pages 62-65). They concluded that most contractors in Russia were only just aware of green buildings and standards, such as LEED and BREEAM. The survey also showed that, at the time, a significant number of contractor requirements under BREEAM were mostly deemed unfeasible by contractors within the Russian construction industry. In order to examine the development of Russia’s green building sector in more detail from the contractor perspective, this article presents the results of a similar survey undertaken in 2014. To the best knowledge of the author, such surveys are rare or non-existent in the Russian real estate market. This article therefore aims to fill a gap in the evolving body of knowledge on green buildings in Russia. - use of recycled aggregates. The survey assessed contractor perceptions by measuring how they view the feasibility of conforming with these requirements in the current market conditions, and the degree of compensation they would expect from a building’s owner if a requirement was deemed feasible. As the BREEAM standard has been adapted to the conditions of various countries and regions to date, and is currently the most preferred standard by developers in Russia (as at the publication date of this article there were 17 BREEAM certified projects in Russia, significantly more than those certified under LEED, i.e., 9 projects), BREEAM provided a valid framework for the purpose of our survey. In total, 16 contractors responded to the survey - mainly international contractors active in the Moscow and St Petersburg markets, two markets within which almost all certified green buildings are currently located. Although this number is a relatively small subset of the entire construction market in Russia, the results still provide a highly valid insight, because the majority of the participants, 57%, have actually been involved in green building projects in Russia. 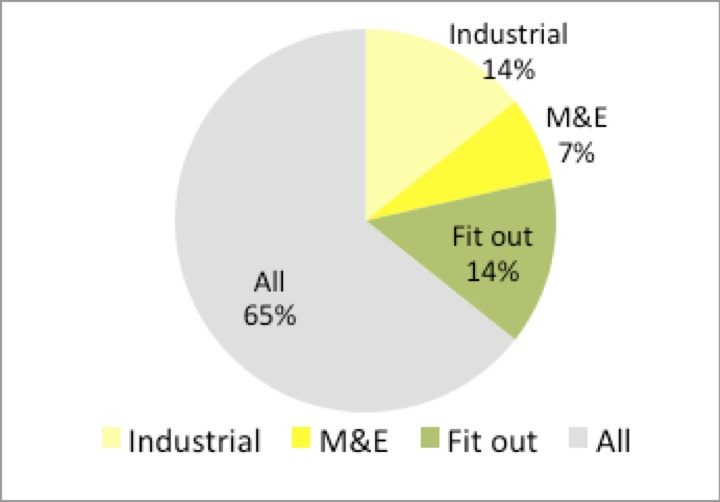 As to construction industry types involved in the survey, 65% of the contractors are middle or large general contractors operating in multiple sectors (e.g., commercial, industrial, retail and residential); 14% are fit-out contractors and industrial contractors each; while 7% specialize in mechanical and electrical design and construction activities. Together they effectively represent a pioneering group of contractors for Russia’s green building sector. It should also be noted that, among those surveyed, three contractors are listed in ENR’s Top 150 International Contractors, a highly-respected annual compilation of international contractors by Engineering News Record (ENR) Journal which ranks contractors in terms of their turnover. Our survey shows that while no contractors had been involved in a sustainable construction project as at 2010, 54% of the respondents were engaged in a sustainable construction project as at 2014. The survey also reveals that awareness of green buildings is on the rise. In 2010, no contractor claimed extensive knowledge about green building standards, while 88% indicated partial knowledge; 12% responded that they were not aware of any standards. In 2014, while 8% of the contractors still stated that they were unaware of green building standards, surprisingly 31% stated that they now had extensive knowledge through training and hands-on experience. This result provides clear evidence that some contractors are becoming increasingly specialized in green building development and its related standards in the Russian market. When asked which international green building standard they would choose back in 2010, only 20% of the contractors stated LEED or BREEAM, with the majority acknowledging that they knew nothing about international green building standards. In 2014, half of the respondents said they would prefer LEED or BREEAM, while, this time, 50% of the contractors stated that they did not know about them, a 30% reduction on the 2010 figure. Among the contractors surveyed, LEED seems to be the leading standard with a narrow margin of 8% over BREEAM. This presents an interesting contrast to the actual distribution of BREEAM and LEED certified projects currently in Russia, which is 65% vs 35% respectively. ■ Use of recycled aggregates: whether the use of recycled aggregates is feasible in the Russian market in order to reduce the consumption of raw materials. ■ Site waste management: whether construction waste for key materials (e.g., glass, paper, metals, etc.) can be collected, sorted and recycled to reduce landfill and increase the reuse of such materials. ■ Responsible sourcing of materials: whether common construction materials, such as timber, plasterboard and plaster, bituminous materials (insulation materials), tiles, concrete, etc., can be sourced from producers who comply with responsible production methods, such as ISO 14001 and other similar environmental preservation systems. ■ Construction site impacts: whether contractors can monitor, report and set targets in areas such as CO2 emissions from site operations, water and electricity consumption, and air pollution from site operations, as well as using timber that is 100% legally sourced. ■ Commissioning manager appointment: whether a commissioning expert can be appointed at the early design stage to ensure that the engineering systems commissioned take into account every phase of the project and, ultimately, that they operate highly effectively during operation. ■ Environmental and social code of conduct: whether contractors can provide safe and adequate site access (good lighting, barriers, no hazards, site markings, etc. ), ensure good neighborhood relations, conduct environmentally aware practices (e.g., low energy consumption), and maintain a safe and considerate work environment. ■ Insulation: whether contractors can procure and use thermal insulation in projects that has low environmental impacts and is pre-approved by the Green Guide (a certification system of BREEAM). ■ Building user guide: whether contractors can prepare a detailed user guide for building operations that can be used by non-technical people to understand and operate the building engineering systems more efficiently. The survey also asked the contractors what it takes to comply with these requirements and if they are deemed feasible in the Russian construction market (e.g., can additional compensation be gained from the owner). ■ - environmental and social code of conduct. ■ Construction site impacts, including monitoring, reporting and setting targets for energy and water consumptions, minimizing CO2 emissions from site operations and from vehicles transiting to/from the site, and using environmentally-friendly materials and implementing an Environmental Management System on site. ■ Responsible sourcing of materials by using key construction materials with Environmental Management System certificates and 100% legally-sourced timber. ■ Preparation and implementation of site waste management plans to handle demolished materials and set targets for main construction material waste groups, in the process eliminating them from going to landfill through reusing the materials in new construction. While a large number of contractors indicated that the fulfillment of these requirements is not feasible under current conditions in Russia, others had the opinion that these can be accomplished if the additional costs are borne by the owners. 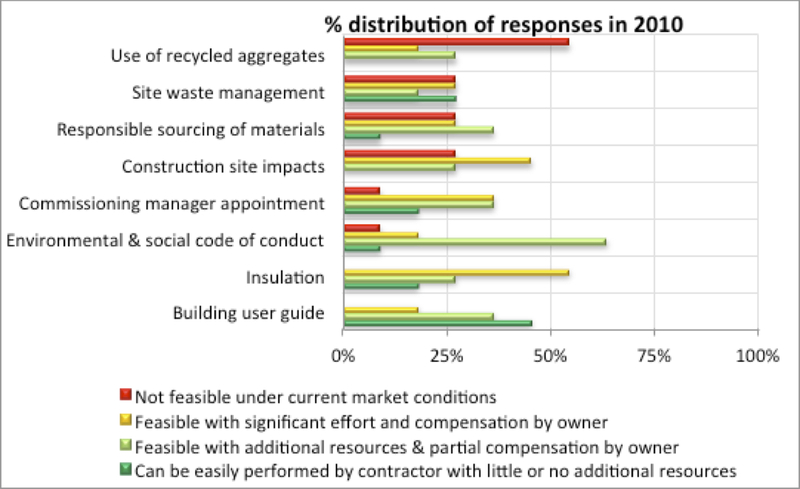 Finally, the great majority of the contractors interviewed had the view that the use of recycled aggregates in new construction is not currently viable. Similar to the results in 2010, the contractors increasingly confirm that BREEAM requirements on a building user guide, the procurement of green certified insulation materials, the appointment of a special commissioning manager to oversee building engineering systems, and an environmental and social code of conduct are all feasible in the Russian market. Interestingly, in 2014 we also observe that site waste management, which divided the contractors back in 2010, is now unanimously considered feasible, indicating that support services, such as waste recycling services, are developing in the Russian market. 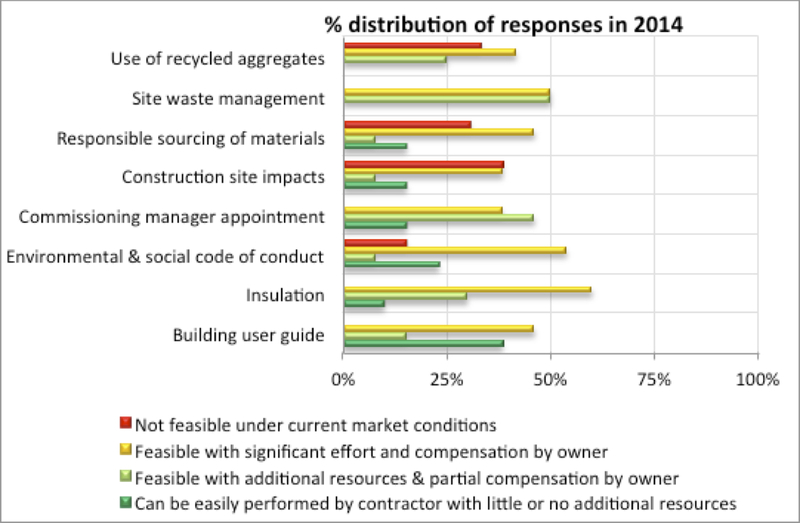 Similarly, the results show that the percentage of contractors who think the use of recycled aggregates is practicable has also increased. On the other hand, a significant number of contractors continue to believe that the responsible sourcing of construction materials and elimination or minimization of construction site impacts are still unrealistic, although a few others believe, if the owners compensate, it might be achievable. The overall results of our survey demonstrate that the green building sector in the Russian real estate market is developing, not just in numbers but also in terms of the sustainability know-how of contractors, who are now playing a critical role in making green buildings a reality. We believe this is a sign of healthy growth for the sector. The increasingly receptive attitude of the contractors toward sustainable construction practices also probably indicates that these practices may now be less costly for developers in comparison to 2010. 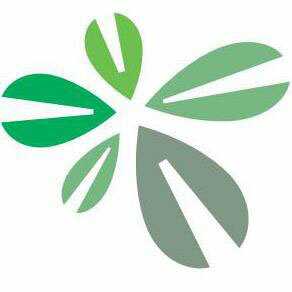 The responses also indicate that the great majority of the contractors are willing to undertake additional efforts, if requested, to meet the requirements of BREEAM for a green building, although not surprisingly this willingness is on condition that the effort is partially or fully compensated by the building owner. At the same time, the availability of certified BREEAM, LEED or other standard assessors is likely to play an important role in making green buildings more feasible at lower costs until the point that developers and contractors have built up sufficient experience and expertise within their own organizations. Another conclusion of our survey is that some BREEAM requirements may still not be practical, or may be too costly for contractors to implement under existing market conditions in Russia. The contractors’ responses suggest that the current supply chain for construction materials is still not ready for the widespread use of recycled aggregates in new constructions as required by BREEAM. Similarly, the responses also create doubt about the feasibility of some contractor operations as required by BREEAM, such as the sourcing of key materials with appropriate Environmental Management System certificates and the control of a site’s operational impacts on the environment in terms of energy and water use, CO2 emissions and the use of 100% legally-sourced timber. Even so, these unfeasible credits will seemingly not play a critical role, as the number of green buildings continues to increase exponentially in Russia. The positive trends in the attitudes of contractors toward green buildings observed in the results of the survey are likely to support this growth in the years to come. This research was conducted by SPC Solutions, a private practice specializing in green buildings and project performance control consultancy (http://s-p-c.solutions). The author of this article would like to thank to all contractors that participated in this survey. The author, Kagan Ceylan, can be reached at kagan.ceylan@s-p-c.solutionsby email or at +7 495 969 9580. Green Buildings in Emerging Markets: Can Warehouses Go Green in Russia? BREEAM and LEED: Which Green Building Standard is More Energy Efficient?